A big part of being an Off-The-Shelf Hacker is having the ability to not only work on software and hardware, but also create things from a blank sheet. Making a working prototype from materials such as brass tubing, nuts and bolts, wire, sensors and microcontroller boards is as much an art as it is a science. What tools do you need? That’s the topic of today’s column. I’ll start with the basics and then in future columns cover more advanced devices that you can add to your collection. I’ve mentioned some of my tools in earlier articles and it probably makes sense to go into a little more depth, including where to buy and how to maintain them. In addition to hand tools like pliers and screwdrivers, readers should take advantage of some of the latest labor-saving power tools, like Dremels and drills. Today, we’ll look at a few tools that I’ve used on almost every recent project. Several pairs of pliers are essential to building microcontroller based projects. The two I use the most are of the needle-nosed variety. The pair on the left sees the most action on tiny devices, like when I’m soldering a 24-gauge wire to a connector on an Arduino Pro Mini or ESP8266 board. The thin jaws are great for making small bends in the wires or guiding a component lead through a small hole. The smaller pair is over 50 years old and was made by a company in Germany called Knipex. My uncle gave them to me back in 1967 because I liked to work on radios and such. Although a bit pricey, a similar model is available on on Amazon. Don’t be too put off by the price. Make a $35 investment today and be happy amortizing it at about $0.70 per year for the next 50 years. A dry, occasionally oiled, tool won’t rust and will last a lifetime. Keeping a tool that long, means you have to treat them with respect. About once a year, I simply take a bit of light machine oil and smear it all over the pliers. Let it soak in for a minute or so, then wipe it off with a paper towel. Also, remember to keep your tools clean and dry. If they do get wet for some reason, be sure to wipe the water away promptly and dry them off. A dry, occasionally oiled, tool won’t rust and will last a lifetime. The longer pair of needle-nose pliers is used a little less often, although certainly, I reach for this instrument on nearly every project. It’s good to have a variety of sizes to suit the job. Pick a small set for fine work and move up to progressively larger models as you need more holding power and are grappling with larger parts. I’ve only had the longer ones for about 30 years. While you could source a set through Knipex, I’d say you can’t go wrong with the Craftsman brand, commonly sold at Sears retail stores. Craftsman hand tools are also sold at Ace Hardware stores. The pair shown in the photo is about 30 years old, too. Keep ’em clean, dry and oiled. Back in my youth, I worked for old Mr. Matthews. He had a diesel truck repair business. He had a crew cut and was seriously old school. He and his wife had five sons and four daughters, who all worked in the shop. I remember at the end of the day, one of the kids would wash off a whole cart full of tools with the hose. A quick blast from the air hose and few quick squirts of oil had everything ready to go for the next day. Your daily tool maintenance routine is up to you. Side cutters are another type of plier you’ll definitely need. 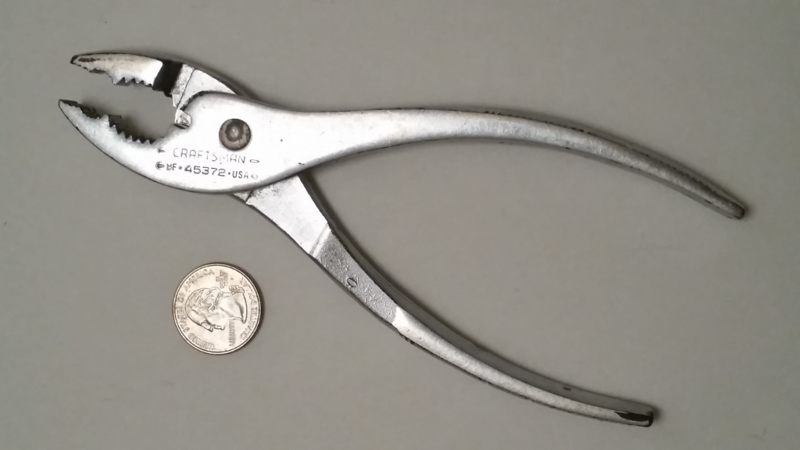 Back in the day, everybody called them “dikes,” short for diagonal side cutters. Side cutters let you lop off wires and nip off the tails after you’re done with a solder connection. I typically use my smallest pair to clean up the leads from a resistor or wire sticking through a printed circuit. The jaws are usually angled down to the cutting edge, thus the reference to a diagonal cutter. The blade is flush with the outside of the pliers on the other side, leaving almost no wire protruding above the surface of the circuit board after a cut. The smaller pair was made by Kraeuter and Company and is stamped with a “101” model number. I’m not sure of its age, although I received them at the same time as the old needle-nosed pliers. I’ve touched up the cutting edge once or twice over the years. This particular pair is made for soft, fine, copper wire only. I saw several similar vintage models on eBay for around $20. Years ago, I also found another use for side cutters: If you lightly grip the insulation about 1/8” from the end of the wire and gently pull, you can strip it off of very thin wire. The trick works on sizes from 22 to 26 gauge. It might take a couple of tries to get the exact pressure right for making a clean cut of the insulation. 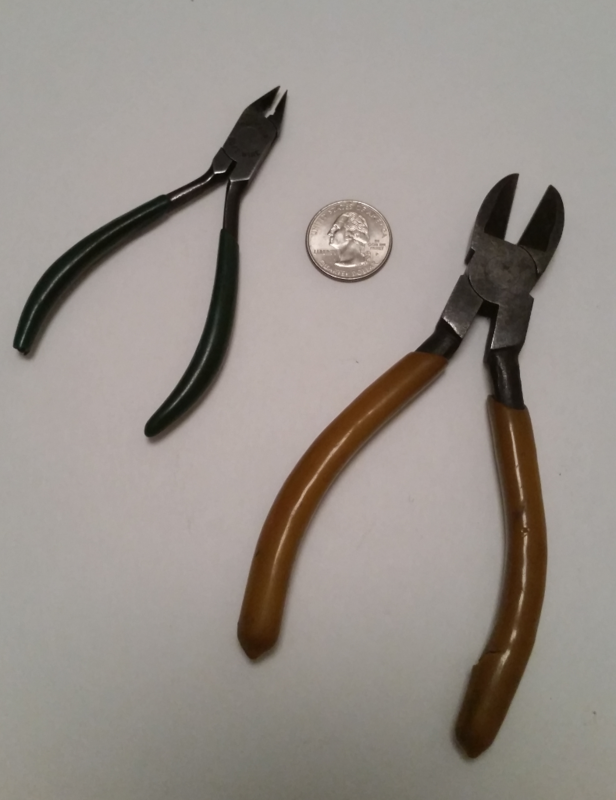 The picture also shows a larger sized pair of side cutters. 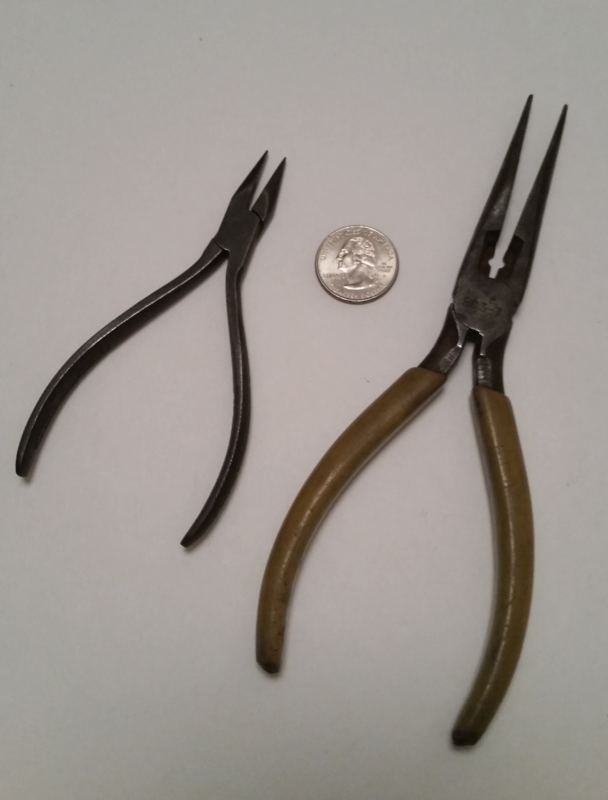 These are used to hack wire from 20 gauge down to about 8 gauge. I use the thick 8 and 10 gauge wire for brackets and making copper loops on some of my steampunk designs. You can also cut a thick wire with the hardware pliers. There are a couple of notches close to the pivot point near the jaws, specifically for that purpose. We’ve just touched on a few of the basic hand tools you’ll need to build Off-The-Shelf Hacker physical computing projects. You probably already have your collection started. You’ll have to decide how stingy you want to be with your tools. I’ve found that other people, even family, often are not as careful with my tools and frequently even forget to put them back, after use. You might have to keep them locked up or buy a secondary (cheap) set that everybody else can use. Your tools will last a very long time if you take care of them and avoid loss. Stay tuned for an exploration of other tools, and how they are used, in upcoming columns. 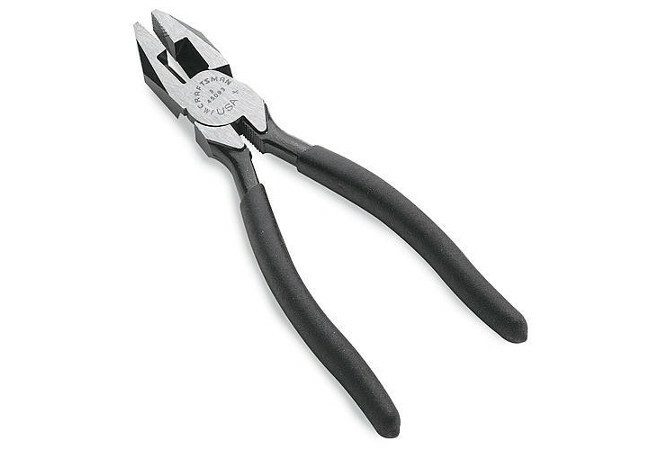 Feature image: Craftsman Linesman pliers.